What you should know about the law degree for non-lawyers. Organizations today face increasingly sophisticated regulatory environments. These businesses now rely on non-lawyer professionals with legal expertise to navigate complex legal issues and achieve their business goals. Professionals with legal knowledge now have a competitive advantage in the workplace. 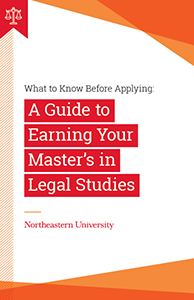 With a Master of Legal Studies (MLS) from Northeastern, you can too.